It’s Friday Night!!! And you know what that means-Friday Night Football!!! This week is a big game! Earilier this week another football mom posted her status on facebook about how loud we need to be at this game. Her status gave me the idea we need to make noisemakers so our boys can hear us!!! 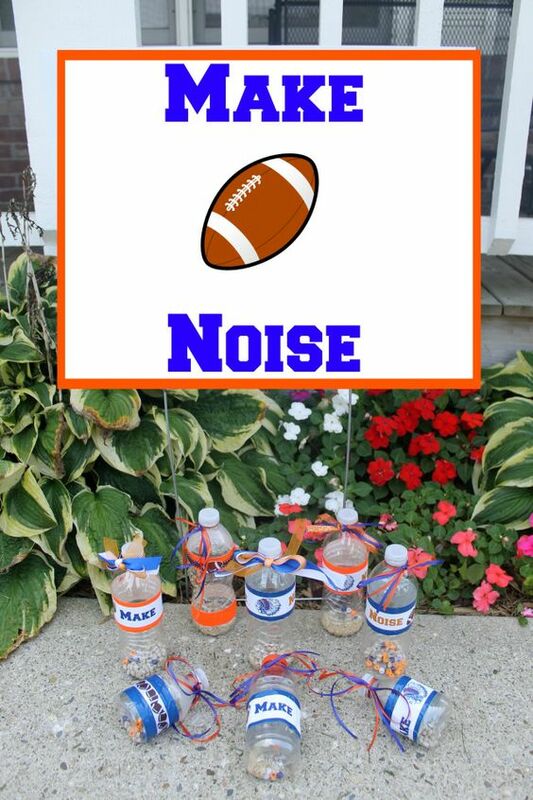 My football mom friend and I discussed lots of different ways to make these noisemakers but in the end we went with something super simple since we wanted to make as many as we could. Save as many plastic bottles as you can, rinse them out and let them dry. Don’t forget to save the lids and remove the labels. I created bottle labels using PicMonkey. To make them I used the Create tool and selected an 8×10 image. Then I uploaded a football and our mascot image, added some text. I had these printed at Office Depot onto full sheet adhesive paper. With my paper trimmer I cut the 8×10 image into 4 labels. We purchased solid colored duct tape in school colors and applied a band around each bottle. Then we added the labels I made on top of the duct tape since the labels were on a white background that really made them pop. Then we played around adding ribbon and stickers to the bottles. Once the outside was done we filled the bottles with beans and rice and some colored beads.The beads are colorful and pretty! Then we hot glued the lids back to the bottles just in case. We even used small bottles for the little kiddos. No he isn’t going to this game but I’m sure he’ll be at a game this season to cheer on his big brother. These Noisemakers are a great way to show your spirit and be loud and proud at any football game! I’ll be posting pictures from the game with our noisemakers onto Instagram so be sure to follow me there.